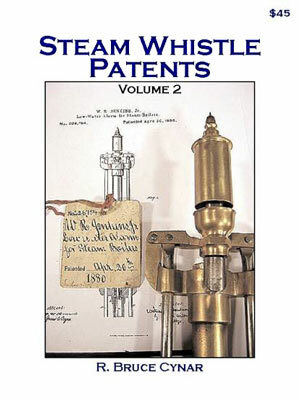 H&W publisher Eric Larson says, "If you have any interest at all in the steam whistle, you must have Steam Whistle Patents, Vol 2 for the wealth of useful information that you'll find in this very comprehensive book." VOLUME 2. Here are 210 new patents plus a few German and English patents and drawings from Scientific American. More steam whistles, locomotive air horns, low water alarms, safety valves, signal buoys, actuating devices, nautical alarms, water gauges, feed indicators and more. All of these include whistles in their design. This Volume contains the full patent list of 426 patents. Sorted by Number, Date, Patentee and Patent Name. And details about a new, easier to use and dramatically more flexible, Internet resource for Patent searching. I have the original, hard cover company catalogs. They are spare doubles of mine. They are all illustrated with many items including steam whistles of course. I'm willing to trade them for other whistle catalogs which I don't have in my catalog collection. Harry D. Barry. The Lunkenheimer Co. a newer catalog, [possibly] 1980. Here's a great way to let prospective customers know about your business. Horn & Whistle is read by people with many interests, and hundreds of people look at this web site every month. Therefore, an ad with us will get your business seen by lots of prospective customers so that you have that many more chances for a sale. Advertise in the magazine, and get a copy of your ad on this web site! For details, get advertising form and read more about advertising. There's no obligation if you fill out the form, but that way, we can get back to you with specific information and prices. Horn & Whistle magazine makes no claims or endorsements for any advertisers or ads, nor does it assume any liability regarding any aspect of the information presented in any ad, or the performance, condition, or operation of any item advertised; nor does it assume any responsibility for damage to property or personal injury or financial loss resulting from the use of any advertised information or items. Where applicable, always follow the advertiser's stated directions and recommendations.